This all started when I was shopping and came across the prepackaged, marinated pork loin. It was nearing its expiration date and marked down. A bit over a pound and for two dollars off the regular price, it seemed like a good deal. On the way home I wondered how I was going to prepare it. Rather than cook a large batch of something, I decided to dice it and freeze it so I could make small meals from materials conveniently at hand and already prepared for cooking. (Place diced pieces on a baking sheet, place in freezer. When frozen a quick pass over the range burner will release them from the sheet. Place in a freezer bag for freezer storage; the already frozen pieces stay separate and don’t freeze in to a large lump.) 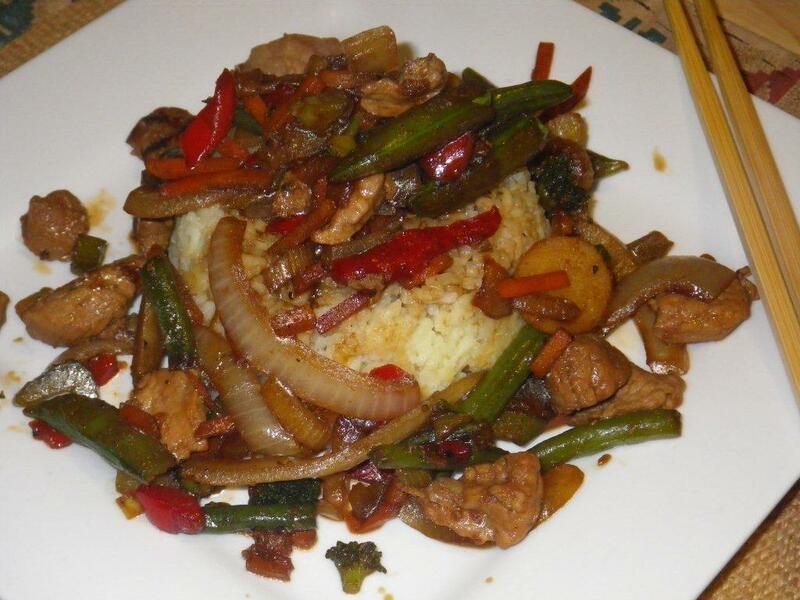 With a bag of prepared frozen stir fry vegetables you have just about all you need to make the dish. In this case the loin was marinated in teriyaki and I used more teriyaki sauce to finish the dish. You can use your favorite stir fry sauce or seasoning just as easily. In the time it takes to cook a pot of rice the rest of the meal is ready. Prepare rice: 1 cup rice, 2 cups chicken broth and 1 tablespoon butter. Bring to a boil while stirring, cover and reduce to a low simmer. Cook for 20 minutes. Preheat wok or frying pan over medium high heat. Add vegetable oil. Add diced pork loin and stir fry until browned. 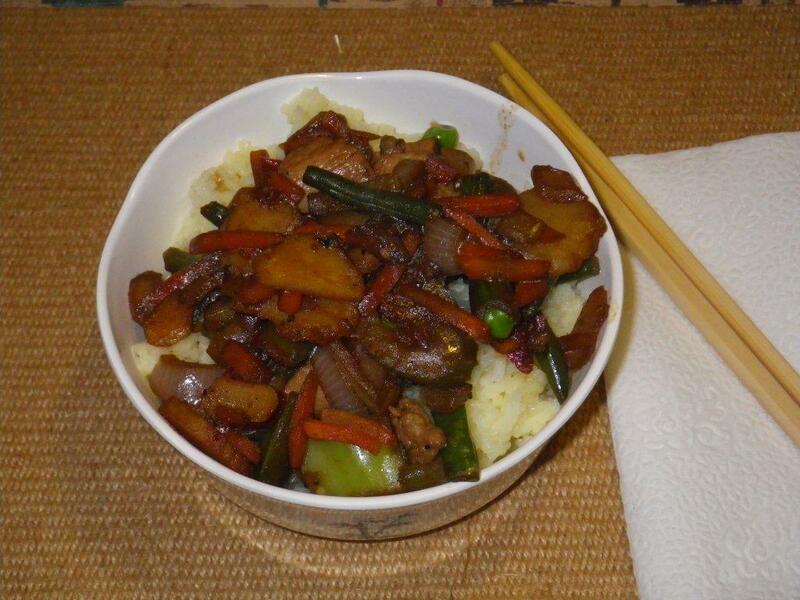 Add frozen vegetables and stir fry until vegetables are softened and start to sizzle in the pan. Cook for 2 minutes then add 2 tablespoons of water. (The water lets the vegetables cook through at a slower rate and prevent burning) Continue to stir fry until the water has evaporated. 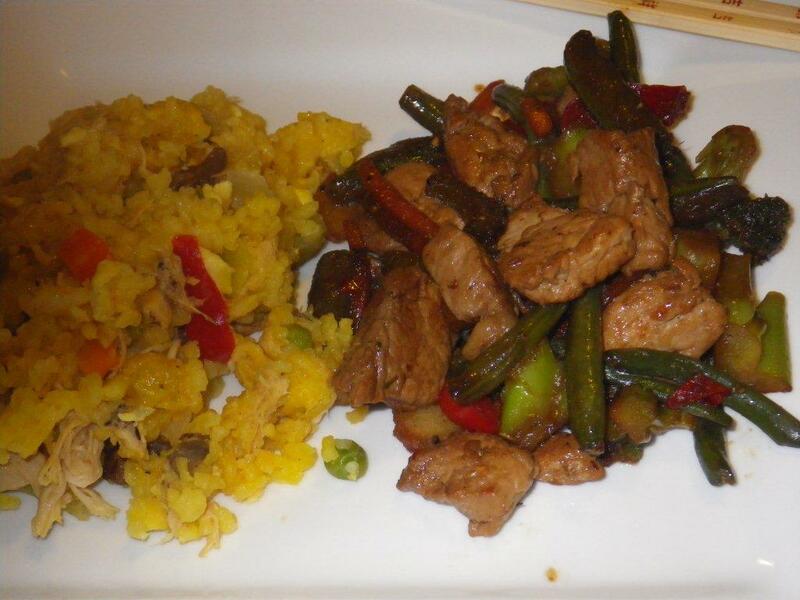 Add teriyaki sauce and stir fry to coat vegetables and pork. As soon as the sauce has thickened remove from heat to prevent burning the sugar in the sauce. Place a serving portion of rice in a small custard bowl. Pack lightly. Invert over serving plate and remove bowl to make a round mound of rice. 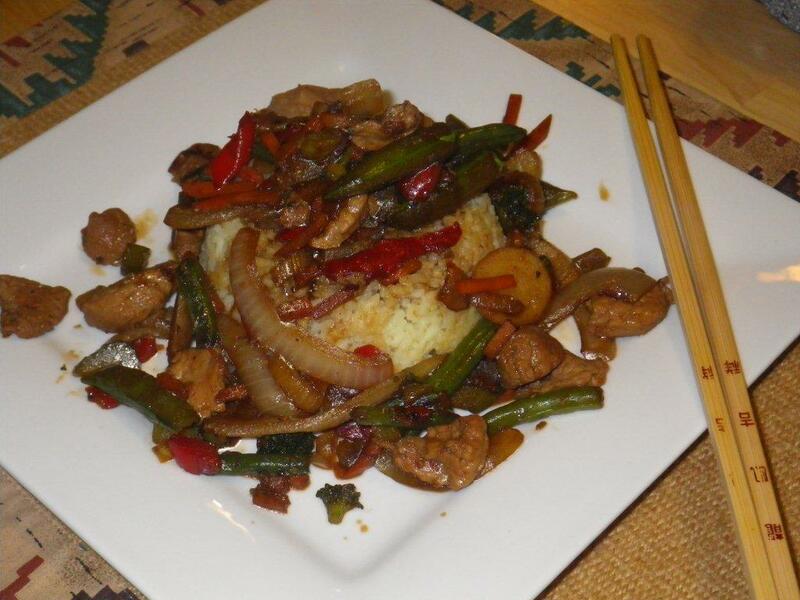 Spoon half of the stir fry pork, vegetables and sauce over the mound of rice.